Three bands of pirates have discovered a treasure filled island. To be victorious, be the first captain to retrieve the treasure or eliminate all enemy pirates. 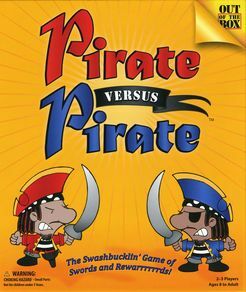 There are three ways to win: retrieve two of the three silver coins, retrieve the single gold coin, or eliminate all rival pirates. Instead of squares or hexagons, you move through adjacent triangles. This gives you the ability to attack in a "circular" manner or land on coins that you don't seem to be heading towards. Also of interest is the No Backstabbing variation, which makes it more difficult to attack rival swashbucklers.